The Panametrics-NDT™ Model 26MG is a low-cost ultrasonic thickness gage designed to make accurate measurements on internally corroded or eroded materials. It weighs only 8.5 oz. (0.24 kg) and is small enough for easy, one-thumb operation. Thickness measurements are made from one side of the material with no need to cut the part. The 26MG offers various practical measurement features such as Automatic Probe Recognition that recognizes transducer types, a Fast Min Mode that holds the minimum reading at a Fast Scan rate of 20 per second, and a Freeze Mode that freezes the display to capture critical thickness data. 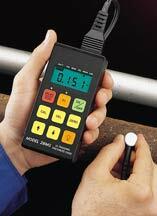 Its LCD with electroluminescent backlight shows thickness measurements in large, easy-to-read numerals. The 26MG has 250 hours of typical battery life with two easy-to-replace AA alkaline batteries. A Low Battery Indicator continuously updates battery status. You can choose from a wide array of transducers with varying frequencies, tip diameters, and temperature ranges to suit many applications (see other side). Typical applications for the 26MG include storage tanks, pipe lines, pressure vessels, boiler tubes, steam lines, ship hulls, and other structures affected by internal corrosion. Note: Thickness range depends on material, transducer type, surface condition, and temperature. Fast Min Mode: Rapid capture and recall of minimum thickness at Fast Rate of 20 per second. Freeze Mode: Freezes display to instantly capture critical thickness. Minimizes transducer couplant lift-off error and facilitates high temperature measurements. Automatic Probe Recognition: Automatically recognizes the listed Panametrics-NDT transducer types. Adjusts internal parameters and corrects V-path error. Zero Compensation Mode: Compensates for transducer temperature and zero offset. Display Hold/Blank Mode: Display holds or blanks after measurement. Electroluminescent Display Back Lighting: Selectable as "On" or "Auto On"
Case/Keypad: Splash proof, impact-resistant Lexan ® case. Sealed, color-coded keypad with tactile and audible feedback. Hazardous Area Operations: As defined by MIL-STD-810E, method 511.3, procedure 1.